Back in the 1960s, the Burke Family Singers were America's answer to Austria's von Trapp Family. Throughout that tumultuous decade, the fabric of the nation's life was of course torn by the war in Vietnam and the impassioned drive of the civil rights movement. It was against this churning backdrop that a large Rhode Island family -- mother, father, and ten children -- set out on the first of what would prove a long series of coast-to-coast tours whose only purpose was to bring the glorious sound of their music to audiences everywhere. They performed in major cities and remote small towns, and during their travels they met the von Trapp Family and recorded an album of Christmas carols with them. 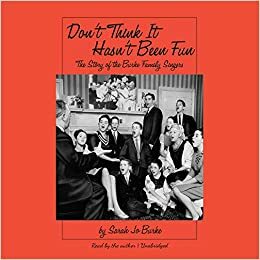 Sarah Jo Burke, the youngest of the five daughters, has written a book that celebrates American values in the best sense and, if nothing else, proves that the family that sings together stays together.